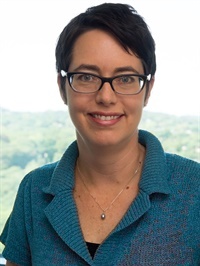 Dr. Amy Street is a clinical psychologist who serves as the Deputy Director of the Women’s Health Sciences Division of the National Center for Posttraumatic Stress Disorder, housed at VA Boston Healthcare System. She is also an Associate Professor in the Department of Psychiatry at Boston University School of Medicine. Dr. Street is a researcher interested in the stressors that women face during military service (including military sexual harassment and assault and combat exposure) and a clinician who provides mental health care for women veterans. Dr. Street’s larger program of research focuses on the examination of gender differences in traumatic stress exposure and stress-related disorders. Her research has received funding from many agencies including the Department of Veterans Affairs and the National Institutes of Health and has been published in numerous peer-reviewed journals.